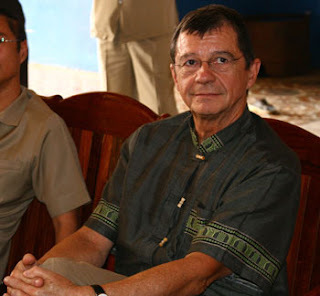 AS the Khmer Rouge tribunal marked the issuance of indictments in its second case yesterday, French Co-Investigating Judge Marcel Lemonde announced that he would be stepping down from his critical position after a four-year tenure. “I ... am passing the baton to someone else,” Lemonde said yesterday at a press conference announcing indictments in Case 002. Siegfriend Blunk, who currently serves as reserve Investigating Judge, will take over Lemonde’s position later this year, as the court moves forward with pending investigations in its third and fourth cases. Lemonde has been pursuing these investigations on his own after his Cambodian counterpart, You Bunleng, declined to sign off on the investigations in June. Defence lawyers sought to have You Bunleng removed after the incident, saying that the uniform opposition among the court’s Cambodian staff to further investigations was the result of political interference. Lemonde himself has also been the subject of challenges from defence lawyers, who charged last year that comments allegedly made by the judge demonstrated a bias towards the prosecution. Defence lawyers also said that he had breached the confidentiality of the investigation by allowing a documentary crew to film witness interviews, and that the international staff of the Office of the Co-Investigating Judges had withheld information from the Cambodian staff.